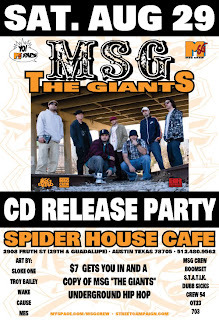 From the getting my hair did department MSG "The Giants" CD Release Party @ Spider House Cafe tonight, Aug 29th! The show starts at 10pm! With art and some great local artists this should be a great show! Can't wait. Copyright © 2011 Austin Hip-Hop Scene. All Rights Reserved. Awesome Inc. theme. Powered by Blogger.